Although it is clear that emotional and motivational manipulations yield a strong influence on cognition and behaviour, these domains have mostly been investigated in independent research lines. Therefore, it remains poorly understood how far these affective manipulations overlap in terms of their underlying neural activations, especially in light of previous findings that suggest a shared valence mechanism across multiple affective processing domains (e.g., monetary incentives, primary rewards, emotional events). This is particularly interesting considering the commonality between emotional and motivational constructs in terms of their basic affective nature (positive vs. negative), but dissociations in terms of instrumentality, in that only reward-related stimuli are typically associated with performance-contingent outcomes. Here, we aimed to examine potential common neural processes triggered by emotional and motivational stimuli in matched tasks within participants using functional magnetic resonance imaging (fMRI). Across tasks, we found shared valence effects in the ventromedial prefrontal cortex and left inferior frontal gyrus (part of dorsolateral prefrontal cortex), with increased activity for positive and negative stimuli, respectively. Despite this commonality, emotion and reward tasks featured differential behavioural patterns in that negative valence effects (performance costs) were exclusive to emotional stimuli, while positive valence effects (performance benefits) were only observed for reward-related stimuli. Overall, our data suggest a common affective coding mechanism across different task domains and support the idea that monetary incentives entail signed basic valence signals, above and beyond the instruction to perform both gain and loss trials as accurately as possible to maximise the outcome. The online version of this article ( https://doi.org/10.3758/s13415-018-0587-3) contains supplementary material, which is available to authorized users. It is well known that humans are strongly influenced by salient events, especially those that involve emotional and motivational stimuli. Past research has revealed evidence for both overlapping and dissociable effects of these affective constructs on task performance, which are usually manipulated either by using emotionally valenced stimuli to alter subjective moods and/or experiences (e.g., Dreisbach, 2006; Paul, Walentowska, Bakic, Dondaine, & Pourtois, 2017; Rowe, Hirsh, & Anderson, 2007), or by introducing monetary incentive cues to promote task performance (e.g., Krebs, Boehler, Roberts, Song, & Woldorff, 2012; Padmala & Pessoa, 2011). However, although numerous studies show significant impact of these affective manipulations on behaviour (e.g., reward: Krebs, Boehler, & Woldorff, 2010; Locke & Braver, 2008; emotion: Kanske & Kotz, 2011; Lindström & Bohlin, 2011), most have focused on examining emotion-related and motivation-related effects independently of one another, leading to two parallel lines of research. This may be driven by the inherent paradigmatic differences between the two affective constructs, in that prototypical reward paradigms promote instrumental goals by associating successful task performance with extrinsic rewards, while tasks employing emotional stimuli do not typically entail such incentives. Despite this, emotion and motivation are thought to be closely related, with theoretical work emphasising the influence of both on the occurrence and direction of specific behaviours (e.g., Bradley, 2000). Notably, it has been suggested that emotional states are elicited by rewarding (and punishing) reinforcers (e.g., reward prospect increases positive affect; Notebaert & Braem, 2015), indicating that the two constructs are codependent on each other (Rolls, 2000), similar to findings by Rutledge and colleagues, who used computational modelling methods to show that recently gained rewards had a direct influence on reactive happiness ratings in participants (Rutledge, Skandali, Dayan, & Dolan, 2014). This is also similar to Lang and Bradley’s (2008) hypothesis that appetitive (or approach) and defensive (or avoidance) motivational circuits are activated in response to positive and negative events, which then gives rise to subjective emotional experiences. Indeed, empirical evidence points to an overlap between reward and emotion in terms of (so-called) valence-action biases, where it is generally found that positive stimuli facilitate approach responses, while negative stimuli elicit avoidance tendencies (e.g., Guitart-Masip et al., 2012; Krieglmeyer, Deutsch, De Houwer, & De Raedt, 2010). Such findings suggest that reward and emotion signals trigger similar action tendencies that are dependent on stimulus valence, in spite of task context and experimental differences. The notion of commonalities between reward and emotion processing is further supported by neural data in that the mesolimbic dopamine (DA) system, which is thought to underlie the reward circuitry that facilitates behaviour as a result of increased DA signalling from the midbrain to striatal and prefrontal regions, has a similar function during the processing of positive affect (see for reviews, Burgdorf & Panksepp, 2006; Wise, 2004). More broadly, Pessoa (2009) proposed that striatal activation may be modulated by overall saliency rather than being tied to specific affective processes, and two other studies have also shown medial midbrain activity for novel (but non-rewarded) stimuli (Bunzeck & Düzel, 2006; Krebs, Heipertz, Schuetze, & Düzel, 2011). Therefore, it seems that the dopaminergic midbrain has multiple roles that are not just tied to reward/value-signalling but also those that include eliciting subjective feelings of happiness after receiving a reward (Rutledge, Skandali, Dayan, & Dolan, 2015), as well as processing other salient events including those that are aversive, which has been well-documented in animal literature (Bromberg-Martin, Matsumoto, & Hikosaka, 2010; Horvitz, 2000; Matsumoto & Hikosaka, 2009). In line with this, multiple meta-analyses have sought to identify common neural regions that are activated in response to positive and negative affect across a diverse range of neuroimaging studies, including those that are related to emotional valence (Lindquist, Satpute, Wager, Weber, & Barrett, 2015) and subjective value (Bartra, McGuire, & Kable, 2013). These studies show a set of core regions such as the anterior insula, ventral striatum, amygdala, and the dorsolateral and ventromedial prefrontal cortices, which are consistently responsive to affect regardless of the task context (e.g., monetary, primary reward/food-based, emotion), suggesting that there may be an underlying system that is responsive to the basic properties of general affect. Similarly, Knutson, Katovich, and Suri (2014) also inferred positive and negative arousal from activations in the nucleus accumbens (NAcc) and anterior insula using a classic reward paradigm (monetary incentive delay task), and emphasised in their conclusion the need for establishing links between specific neural regions to affect, to be able to generate more quantitative inferences from such mappings. However, direct investigations into such common valence-related activations across different affective constructs have been scarce. Given the salient nature of both rewarding and emotional stimuli, it therefore follows that utilising fMRI may help identify regions that code for general positive affect, regardless of whether it is elicited by the inherent ‘rewarding’ quality of positive emotional affect or by an extrinsic, instrumental reward-related counterpart, and similarly also for general negative affect. Although a few studies have incorporated both positive emotion and reward within the same experimental paradigm, they focus on the effect of these states on cognitive control rather than the mere value-related or valence-related signals elicited by the affective stimuli (Chiew & Braver, 2014; Fröber & Dreisbach, 2014). Furthermore, the influence of negatively valenced stimuli has not been tested in these studies, which may be crucial in order to dissociate effects of valence from mere saliency (that is common to both positive and negative events). Finally, thus far, direct comparisons between these two constructs have been mainly explored on the behavioural level (and with pupillometry, which correlated with indices of proactive control in response to rewarded and emotional stimuli; see Chiew & Braver, 2014), with insights regarding shared valence processing at the neural level being sparse (and primarily based on meta-analyses). 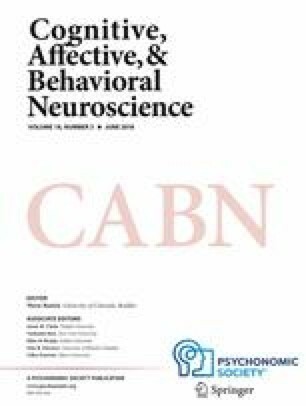 Therefore, the aim of the current study was to identify valence-coding regions that may be common to both emotional and reward-related affect using a within-subjects design, which included both types of affective stimuli within the same experimental session. Specifically, the task consisted of a two-event trial structure, in which the participants first had to respond to an affective event, featuring either an emotional or motivational stimulus (in separate task blocks), and then to a second unrelated event, which was a nonaffective Eriksen flanker stimulus that acted as a ‘filler’ task to prevent direct carry-over effects between the affective stimuli. While this resembles the typical structure of studies that investigate the influence of reward prediction on task performance in a subsequent task (e.g., employing a cue–target structure) with performance on the target being instrumental towards getting the reward, here we moved this instrumental aspect to the first event (i.e., to the affective stimulus part of the trial). Based on this set-up, subtle differences in the ‘filler’ task based on the preceding event are still possible, but our interest was focused on the neural and behavioural responses to the affective stimulus itself. In particular, we were interested in whether any overlap in valence-related regions from our task would match the regions identified in the meta-analyses above (specifically, those that receive DA input including the striatum and prefrontal regions), which would provide direct empirical evidence for an underlying affective network, at least across emotional and motivational task contexts. To this end, we included positive, neutral, and negative conditions for both tasks, which, despite the paradigmatic differences (in that only the reward-related task is contingent on instrumental actions), would allow us to examine across the tasks for a common set of affective regions. We also performed region-of-interest (ROI) analyses on three defined regions identified by Bartra et al. (2013)—specifically, the ventromedial prefrontal cortex, anterior insula, and ventral striatum—to strengthen the link between these well-validated value-coding regions and affect using both emotional and motivational valences, and also to further validate the potential voxel-wise effects from the current study. Based on previous literature including meta-analyses by Bartra et al. (2013) and Lindquist et al. (2015), as well as studies showing the role of dlPFC in negative affect (e.g., Kobayashi, Nomoto, Watanabe, Hikosaka, Schultz, & Sakagami, 2006; Peña-Gómez, Vidal-Piñeiro, Clemente, Pascual-Leone, Bartrés-Faz, & Aleman, 2011), we hypothesised greater sensitivity to positive affect in the ventromedial prefrontal cortex (vmPFC) and ventral striatum (VS), and to negative affect in the dorsolateral prefrontal cortex (dlPFC) and anterior insula. Finally, although our primary objective was to examine the commonality between the two tasks in terms of affective processing, we also tested for task-specific activations to see to what extent the paradigmatic differences would influence the neural activations elicited by emotional and motivational stimuli, which differed in terms of stimuli characteristics (namely faces vs. objects, respectively) and instrumentality. A total of 28 participants (mean age = 23.96 years, SD = 2.97, 14 males) were recruited from Ghent University through the university online recruiting website. Potential participants were excluded if they were outside the 18–35 years age bracket, had a history of neuropsychiatric disorders, or did not have normal or corrected-to-normal vision. Due to poor behavioural performance (scoring two standard deviations below the mean accuracy level of performance calculated across all trials within the experiment), one participant was excluded from all analyses (behavioural and fMRI), resulting in a final sample of 27 participants (mean age = 24.04 years, SD = 3.01, 14 males). Participants gave their written informed consent to participate in the study, which consisted of a functional magnetic resonance imaging (fMRI) experiment and a standard T1-weighted anatomical scan, as well as two additional anatomical scans with special contrasts and four short questionnaires (which are not reported here). They were reimbursed 35€ (plus additional monetary bonus of up to 8€, depending on the fMRI experiment performance) for the session, which lasted approximately 2 hours in total. All experimental procedures were approved by the Ghent University Hospital Ethics Committee. The fMRI session consisted of four functional runs, each corresponding to one task block. The task itself was an event-related design, with two blocks including only stimuli that were associated with reward by instruction (photographs of objects) and the other two blocks including only emotional stimuli (photographs of faces). This was done to examine valence-related activity for both reward-related and emotional processes within the same participants, whilst reducing context effects and direct switch costs between motivation and emotion trials, which would be emphasised in a fully randomised event-related design. The two types of task blocks, termed Reward and Emotion blocks, consisted of 96 combined two-event trials each and lasted 11.23 minutes each. For the Reward blocks, each combined trial began with the presentation of a unique ‘affective’ stimulus for 1,000 ms (see Fig. 1 for an illustration of the task). The stimulus belonged to one of three categories (animal, man-made object, or food) chosen from the Bank of Standardized Stimuli (BOSS) dataset (Brodeur, Guérard, & Bouras, 2014). The categories signalled three possible reward conditions: gain money (Gain); (avoid to) lose money (Loss); or no change in reward (NeutRew). Category-reward mappings were counterbalanced across participants. Participants were required to respond to the stimulus category/condition by choosing one of two options presented underneath the stimulus (see Fig. 1). The possible options were ‘+’ (to indicate that the item was a Gain category item, and therefore signalled the possibility of earning a reward if chosen correctly), ‘0’ (indicating that the item did not signal earning or losing any reward), and ‘−‘ (signalling loss of reward if not chosen correctly). Only two out of three possible options were presented per stimulus in a randomised fashion; however, the correct option was always present. This trial-by-trial switching of the response options was included to ameliorate low-level response biases to one of the stimulus categories. Participants were informed that they would only gain and avoid loss of money if they correctly identified the respective stimulus category (i.e., they were required to respond by accurately categorising whether the item belonged to a Gain, a NeutRew, or a Loss category by selecting ‘+’, ‘0’, or ‘−’, respectively). They earned 12c for every correct response to Gain trials, while losing the same amount for every incorrect response to Loss trials. There was nothing to gain or lose for the neutral stimulus category (‘0’). In total, participants could earn or lose up to 8€ during the experiment. After a variable fixation interval of 1,250–8,000 ms, a flanker stimulus (composed of 5 simple arrows in a row) was presented for 250 ms. Participants were required to indicate whether the central arrow was pointing to the left or the right, which could either be congruent or incongruent with the direction to the flanking arrows. Participants were explicitly informed that their performance on this ‘filler’ task had no influence on the reward outcome. After another variable fixation interval of 2,000–8,750 ms, the next trial started. All events were thus separated by a variable stimulus-onset-asynchrony (SOA) of 2,250–9,000 ms (stimulus duration plus fixation interval), following a pseudo-exponential distribution based on multiples of the scan repetition time (TR, with 70% at 2,250 ms; 15% at 4,500 ms; 10% at 6,750 ms; and 5% at 9,000 ms). Such TR distributions allow for an effective estimation of event-related blood-oxygen-dependent (BOLD) responses (Hinrichs et al., 2000). All affective and flanker stimuli had response windows of 2,000 ms and 1,500 ms, respectively, and the average length of each combined trial was 7,000 ms. For both events, participants responded using an MR-compatible button box, which was placed under the participant’s right hand in the scanner. The buttons under the right index and middle fingers corresponded to the ‘left’ and ‘right’ response, respectively. The Emotion blocks followed exactly the same two-event trials structure. However, here the stimuli for the first task were emotional faces with Happy, Angry, or Neutral (NeutEmo) expressions taken from the NimStim face stimulus set (Tottenham et al., 2009), which corresponded to the three experimental conditions. Importantly, unlike the Reward blocks, these affective stimuli were not associated with monetary incentives (neither gains nor losses), but participants were instructed to perform well in all trials across the entire experiment. Furthermore, the response options provided below the stimulus now matched the facial expressions and included positive, neutral, and negative emoticons. Like in the Reward blocks, response options for the affective stimuli were switched randomly in each trial, which was followed by a congruent or incongruent flanker stimulus. In terms of basic valence, we assumed that Gain and Happy stimuli qualify as positive (desirable) events, Loss and Angry stimuli as negative (to be avoided) events, and NeutRew and NeutEmo as neutral events within their respective task context. Hence, for the behavioural and fMRI analyses, we combined the task factor (Reward/Emotion) with a valence factor (positive/neutral/negative). The four blocks were presented in an alternate order (e.g., Emotion-Reward-Emotion-Reward or Reward-Emotion-Reward-Emotion), and counterbalanced between participants so that half the participants started with the Emotion task first, while the other half started with the Reward task. For each block, motivational and emotional affective stimuli (positive/neutral/negative) were presented 32 times per condition, yielding a total of 96 events, and flanker stimuli (congruent/incongruent) were presented 48 times for each congruency, again resulting in a total of 96 events. Halfway through each block, participants were presented with a feedback screen indicating their level of performance in percentage (and the amount of monetary reward earned thus far for the Reward blocks). At the end of the block, another feedback screen was presented with their overall block performance (and the total reward amount). All affective stimuli were trial-unique, i.e., only shown once during the experiment. Prior to the fMRI experiment, all participants were given explicit verbal instructions on which item categories represented Gain, NeutRew, and Loss conditions, and shown examples of different items belonging to the three category types. They were then given a 5-minute practice block outside of the scanner to ensure they understood both the Reward and Emotion tasks, and, in the case of the Reward blocks, were comfortable with which item category mapped onto which Reward condition. Images were acquired using a 3T Siemens Magnetom Trio scanner (Erlangen, Germany) with a 32-channel head coil at the Ghent Institute for Functional and Metabolic Imaging, Ghent University Hospital. T1-weighted structural volumes were acquired from each participant using a 3-D magnetisation-prepared rapid acquired gradient echo (MP-RAGE) sequence with the following parameters: repetition time (TR) = 2,250 ms; echo time (TE) = 4.18 ms; field of view (FOV) = 256 mm; flip angle = 9 degrees; 176 sagittal slices; matrix size = 256 × 256; voxel size = 1 × 1 × 1 mm; scanning time = 5.14 min. Each functional run (corresponding to one task block) consisted of 300 T2*-weighted echo-planar imaging (EPI) images with the following parameters: TR = 2,250 ms; TE = 30 ms; FOV = 216 mm; flip angle = 90 degrees; 30 transverse slices using an interleaved sequence; matrix size = 128 × 128; voxel size = 1.7 × 1.7 × 3 mm; scanning time = 11.23 min. Total scanning time, which included a localiser scan, the MP-RAGE scan, four functional runs, and two additional anatomical scans amounted to 64.6 minutes. Task stimuli were projected onto a mirror, which was attached to the head coil. Presentation® software (Version 18.1; Neurobehavioral Systems; www.neurobs.com) was used to program and display the experimental paradigm, and also to record the participants’ responses. Additionally, to account for potential physiological noise confounds arising from respiratory or heart-rate variations (especially in regions close to large cerebral vessels and cerebrospinal fluid, e.g., vmPFC; Iacovella & Hasson, 2011), breathing and pulse signals were measured using the BIOPAC MP150 system (BIOPAC Systems, Inc., CA; www.biopac.com) at a sampling rate of 2000 Hz, which were recorded with the AcqKnowledge 4.1 software (BIOPAC Systems, Inc., CA). Behavioural data were statistically analysed using repeated-measures analyses of variance (ANOVA), one-way ANOVAs, and paired t-tests. All statistical effects that violated Mauchly’s test for the assumption of sphericity were corrected using Greenhouse–Geisser estimates of sphericity, given by SPSS software (Version 22, IBM Corporation, Armonk, NY). Functional MRI images were preprocessed using SPM12 software (Wellcome Trust Centre for Neuroimaging, London, UK; http://www.fil.ion.ucl.ac.uk/spm) operating in MATLAB R2014b (MathWorks, Natick, MA). Prior to statistical analysis, all participants’ images were preprocessed using the following steps: (1) discarding of the first four EPI volumes to allow time for magnetisation to reach equilibrium; (2) coregistration of the anatomical image and the functional EPIs to the SPM template; (3) segmentation and spatial normalisation of the coregistered anatomical image to the standard Montreal Neurological Institute (MNI) space; (4) slice-timing correction of the EPI volumes to account for between-slice temporal differences (using the middle slice  as reference; interleaved acquisition); (5) realignment of the time-series images; (6) normalisation of the EPIs to MNI space using the deformation fields generated in Step 3, which were then resliced to a voxel size of 1.5 × 1.5 × 2 mm; and (6) spatial smoothing of the EPIs using an isotropic Gaussian filter of 6 × 6 × 6 mm at full-width half maximum. Furthermore, additional physiological noise correction using the BIOPAC data was performed by applying the RETROICOR model (Glover, Li, & Ress, 2000) with the MATLAB PhysIO Toolbox (Kasper et al., 2017). This generates six cardiac phase regressors (third order), eight respiratory phase regressors (fourth order), and four cardio-respiratory interaction regressors (first order), that are added into the general linear model at the first level. At the single-subject level, BOLD responses were modelled by delta functions at stimulus onset for all experimental regressors (including those of no interest, e.g., errors and breaks), across all four runs. A statistical model was then calculated by applying a canonical haemodynamic response function to the onsets, resulting in time courses that were then applied to a general linear model (GLM). To remove low-frequency noise, a high-pass filter with a cut-off frequency of 128 s was used, and serial autocorrelations were estimated using an AR(1) model. To examine potential common valence signals across both reward and emotion processing, all four blocks were entered into one GLM. This resulted in three affect-related regressors per task (Reward: Gain, NeutRew, Loss; Emotion: Happy, NeutEmo, Angry), and six flanker regressors (congruent/incongruent after each of the three affective stimuli), as well as the corresponding temporal and dispersion derivatives. In addition, all errors (including missed and incorrect trials), midblock breaks, six motion regressors derived from the realignment step, and the 18 physiological regressors from the PhysIO Toolbox were included as additional regressors of no interest. Finally, simple linear contrasts were computed based on the regressors for each participant and condition, which were then taken to the second-level analysis. At the group level, voxel-wise random-effects analyses were conducted for the affective stimuli using a 3 × 2 flexible factorial design, with Valence (positive/neutral/negative) and Task (Reward/Emotion) as factors. For the Valence factor, differences between Positive and Negative trials were tested in both directions. As we were interested in the direct comparison of the two salient conditions, neutral trials were not included in this analysis (i.e., they were set to zero in all contrasts). Despite our main objective being the potential commonality of valence-related regions, two additional contrasts (Reward > Emotion; Emotion > Reward) were calculated to test for differential activity patterns between the two tasks, as well as the potential interactions between the factors. Activations were deemed significant if they survived a family-wise error (FWE) correction at the cluster level (p < .05), based on an auxiliary uncorrected voxel-wise threshold of p < .001. To visualise neural activity differences yielded by the voxel-wise analysis, mean beta values were extracted from regions of interest (ROIs) based on the voxel-wise GLM contrasts, using the Marsbar toolbox (Brett, Anton, Valabregue, & Poline, 2002). To this end, spherical ROIs were centred at the local maxima of activated clusters with a radius of 6 mm. It should be noted that these ROI analyses were conducted mostly for illustrative purposes without further statistical inference, except for a follow-up test of potential interactions in the valence-sensitive ROIs, which represents an independent test in this factorial design (see Results section for details). Furthermore, based on previous work linking positive and negative affect to specific neural regions, we performed ROI analyses on three regions that have been consistently associated with valuation processes. We used ROI masks provided by Bartra et al. (2013, supplementary data) for two regions that have been associated with carrying modality-independent value signal (vmPFC: centre-of-mass x, y, z = −3, 10, −4; and bilateral ventral striatum (VS): centre-of-mass = −1, 46, −7), and created two spherical ROIs of 6 mm using Marsbar (Brett et al., 2002) based on coordinates from the same meta-analysis for the left and right anterior insula (left: −30, 22, −6; right: 32, 20, −6), which have also been linked to both positive and negative effects. All four ROIs (vmPFC, VS, left/right anterior insula) were checked against the averaged MP-RAGE image of the current participants (calculated with the ImCalc function in SPM) to visually ensure anatomical correspondence. Mean beta values were then extracted from these regions and subjected to a 2 (Valence: positive/negative) × 2 (Task: Reward/Emotion) repeated-measures ANOVA, separately for all four ROIs (vmPFC, bilateral VS, left/right anterior insula), and adjusted for multiple comparisons using Bonferroni correction. Lastly, additional follow-up analyses were conducted to examine potential saliency effects (arising from both positive and negative stimuli as compared with neutral ones), regional overlap of valence effects in form of a conjunction between tasks, possible contributions of average RT to valence-based activity modulations, as well as a behavioural analysis exploring potential time-on-task differences between Reward and Emotion tasks. The respective procedures and results are detailed in the Supplemental Materials (see Follow-Up Analyses section). Overall, participants responded accurately to both affective and flanker stimuli across all stimuli (mean % ± SD: 92.23 ± 4.42 for Reward affective stimuli; 94.78 ± 5.59 for Reward flanker stimuli; 88.77 ± 6.03 for Emotion affective stimuli; 92.98 ± 6.21 for Emotion flanker stimuli). Average reaction time (RT) data indicated faster response times for the flanker stimuli compared with the affective stimuli (mean ms ± SD: 759.42 ± 72.10 for Reward affective stimuli; 515.39 ± 73.65 for Reward flanker stimuli; 838.27 ± 74.04 for Emotion affective stimuli; 516.73 ± 83.42 for Emotion flanker stimuli). As our main focus was on the processing of affective stimuli, no further statistical tests were performed on the flanker trials. The 3 (Valence: positive/neutral/negative) × 2 (Task: Reward/Emotion) repeated-measures ANOVA on mean accuracy affective stimuli data revealed significant main effects of Valence, F(1.60, 41.76) = 25.05, p < .001, partial ƞ2 = .491, and Task, F(1, 26) = 19.72, p < .001, partial ƞ2 = .431, as well as a significant Valence × Task interaction, F(1.60, 41.69) = 19.08, p < .001, partial ƞ2 = .423 (see Fig. 2). This interaction was driven by significant differences across all conditions within the Emotion task (Happy vs. NeutEmo: p < .001; Happy vs. Angry: p < .001; Angry vs. NeutEmo: p < .001), where NeutEmo resulted in the lowest error rate, followed by Happy and then Angry, in contrast to only the Gain condition being significantly more accurate from both NeutRew and Loss conditions in the Reward task (Gain vs. NeutRew: p = .014; Gain vs. Loss: p = .008; Loss vs. NeutRew: p > .1; see Fig. 2 for error rates). A second ANOVA was conducted for affective stimuli RTs, which also revealed significant main effects of Valence, F(1, 26) = 11.03, p < .001, partial ƞ2 = .298, and Task, F(1, 26) = 85.73, p < .001, partial ƞ2 = .767, and a significant interaction, F(1, 26) = 15.23, p < .001, partial ƞ2 = .369 (see Fig. 2). Overall, participants performed significantly faster in the Reward task compared with the Emotion task (p < .001). The main effect of Valence reflected significant differences between positive and neutral stimuli (p = .026), as well as positive and negative ones (p < .001). Due to the interaction between Valence and Task, additional one-way ANOVAs were conducted to decompose the effects of Valence (Reward: Gain/NeutRew/Loss; Emotion: Happy/NeutEmo/Angry; see Fig. 2) for each task separately, which again resulted in significant Valence effects for both Reward, F(1, 26) = 8.98, p < .001, partial ƞ2 = .257, and Emotion, F(1.55, 40.44) = 28.37, p < .001, partial ƞ2 = .522. For Reward, post hoc tests yielded significant differences for Gain versus NeutRew (p = .001), as well as for Gain versus Loss (p = .005) conditions, where Gain trials were significantly faster than NeutRew or Loss trials. There were no differences for NeutRew versus Loss conditions (p > .1). For Emotion, there were significant differences for Angry versus NeutEmo stimuli (p < .001), as well as for Angry versus Happy (p < .001), where Angry trials elicited the slowest responses, but not for Happy versus NeutEmo (p > .1) affective conditions. We conducted a flexible factorial fMRI analysis across all affective stimuli to test for general valence effects, as reflected in the main effects of positive minus negative valence and vice versa (see Table 1A; Fig. 3). In line with our hypothesis, we observed valence-based modulations across tasks, with positive stimuli eliciting stronger activations in the right superior medial gyrus compared with negative ones, and negative stimuli eliciting stronger responses than positive ones in the left inferior frontal gyrus (pars triangularis). No interactions between task and valence were observed in these regions with a conservative statistical threshold, indicating that valence was represented in a similar fashion across tasks. To quantify this absence of an interaction with a more sensitive test, we extracted beta values from the two regions that displayed a significant main effect of valence (illustrated in Fig. 3), and conducted a 2 (Valence: positive/negative) × 2 (Task: Reward/Emotion) ANOVA to specifically test for an interaction. The interaction was not significant for either the superior medial gyrus (p > .507) or the inferior frontal gyrus (p > .507). As these two contrasts (main effect and interaction) are orthogonal in a factorial design (i.e., the cross products of each contrast sum up to zero), we consider these tests as being independent and thus noncircular (i.e., each can be estimated independently of the other; Olive, 2017). To confirm this null finding, a Bayesian hypothesis testing approach (Jeffreys, 1961; Wagenmakers, 2007) was employed to calculate the likelihood of the absence of an effect (e.g., show evidence for the null hypothesis), using JASP (Version 0.8.2, JASP Team, 2017). This resulted in an inverse Bayes factor (BF01) of 3.61 for the superior medial gyrus and a BF01 of 3.46 for the inferior frontal gyrus, indicating ‘moderate’ evidence for the null hypothesis in both regions. Going back to the voxel-wise analysis, we also observed differential activations between the two task contexts (Table 1B; Fig. S1 in Supplemental Materials), with the Emotion task eliciting stronger BOLD responses in the left putamen as well as in multiple right prefrontal and temporal regions, while affective stimuli in the Reward task elicited differential BOLD activity in the bilateral fusiform gyri and the left orbitofrontal gyrus. Finally, an interaction effect between Valence (neutral/negative) and Task (Reward/Emotion) was observed in the left middle temporal gyrus (Table 1C; Fig. S1 in Supplemental Materials). This interaction was driven by larger signal differences between the neutral and negative conditions in the Emotion task, compared with the Reward task. To further qualify our voxel-wise findings and relate them to existing literature, we extracted mean beta estimates from three independent ROIs that have been commonly implicated in valence processing (vmPFC, bilateral VS, anterior insula), taken from Bartra et al.’s (2013) meta-analysis on subjective value (see Fig. 4). We found a significant valence difference in the vmPFC, with greater activity observed for the positive condition compared with negative, F(1, 26) = 8.468, p = .007, partial ƞ2 = .246, which is analogous to our findings in the right superior medial gyrus. However, we did not observe any other significant main effects that survived after Bonferroni correction (all ps > .0125), except for a trend of higher activity for negative affect in the left anterior insula, F(1, 26) = 4.699, p = .040, partial ƞ2 = .153; see Fig. 4c), which mirrored our findings in the left inferior frontal gyrus (see Fig. 3b), and also a potential task difference in the NAcc, F(1, 26) = 5.740, p = .024, partial ƞ2 = .181. Again, no interactions between task and valence were found in any of these independent ROIs. To confirm this, an inverse Bayes factor was calculated for the vmPFC ROI (the only region displaying a significant valence main effect), resulting in a BF01 of 3.020 for the interaction, indicating ‘moderate’ evidence for the null hypothesis. The results of four follow-up analyses are described in detail in the Supplemental Materials section (see Follow-Up Analyses). In brief, in terms of a potential global saliency effect (based on the [Positive + Negative] > Neutral contrast), we found activity in bilateral temporal regions for the Emotion task only (see Fig. S2). Second, there were no surviving overlapping voxels between the Reward and Emotion tasks when using a conjunction method (e.g., by creating Positive > Negative, and Negative > Positive contrasts separately for each task), suggesting that the tasks may have been underpowered when considered separately (see Fig. S3). Third, when probing for any modulatory effects of RT (including RT as a covariate at the second level), we found that two regions (left IFG and left superior parietal lobule) covaried with RT in the Negative > Positive contrast (see Fig. S4). While the IFG cluster partly overlaps with the cluster revealed by the original valence contrast, the valence-based activity modulation in IFG is preserved when including RT as a covariate of no interest, suggesting that the valence-based modulations are not mainly driven by RT differences. Lastly, when exploring behavioural time-on-task effects (by splitting the data based on feedback moments in the middle and at the end of each block), we found significantly faster responses in the second block for both tasks, indicating a global practice effect, as well as response facilitation in the second half of the first block only for the Reward task. The main aim of the current study was to investigate common valence-related neural activity in two related (but distinct) affective domains, namely emotion and motivation. Although a wealth of studies have reported valence differences within separate affective domains (which has led various meta-analyses to propose a core set of regions), it has not yet been empirically tested whether such a general affective system underlies both emotion and reward-related processes when both are manipulated in a matched, within-subjects fashion. We observed both valence-related activity across as well as task-related dissociations between the two domains in the current study, which will be discussed more in detail below. We found global valence-based activity modulations in two cortical regions across the two tasks, providing evidence for a shared mechanism that codes for positive and negative valence—which is consistent with theoretical and empirical work that have developed from (for the most part) separate research lines. Specifically, across both tasks, there was preferential activation for positive compared with negative stimuli in the superior medial gyrus (as part of the ventromedial prefrontal cortex; vmPFC), while activity in the left inferior frontal gyrus (IFG/pars triangularis, as part of Brodmann’s area 45, extending into dorsolateral prefrontal cortex; dlPFC) was stronger for negative versus positive stimuli. Importantly, we did not observe any interactions between task and valence in the voxel-wise analysis, indicating that positive and negative affect modulate neural activity similarly across both tasks to a certain extent. However, as voxel-wise comparisons can be too conservative for small effects, we used an ROI approach for both vmPFC and IFG/dlPFC to statistically test only for potential interactions, which would indicate otherwise (i.e., signal from one of the tasks strongly driving the overall main effect). This is particularly pertinent as analysing the tasks separately and taking a conjunction approach did not yield any overlapping voxels (see Fig. S3 in Supplemental Materials). However, the absence of a Task × Valence interaction in vmPFC and IFG/dlPFC (both in the voxel-wise and independent ROI analysis), together with the results from the inverse Bayes factor analyses (which assesses the likelihood of the null hypothesis being true), suggests that both tasks contribute to the main effect of valence in these regions in a comparable manner and that the absence of within-task valence effects may be due to a lack of power. In line with our hypothesis, these findings are largely consistent with existing meta-analyses on valence coding (e.g., Bartra et al., 2013; Kohn et al., 2014; Lindquist et al., 2015), that have found robust vmPFC and IFG/dlPFC activations for positive and negative effects of subjective value. What is particularly interesting is that these regions were found for two tasks that are fundamentally different in nature, in that one involves an instrumental action for receipt of an extrinsic reward while the other is based on pure emotional saliency. In fact, this distinction has led meta-analytic studies to separate their assessments according to the type of affect, such as focusing only on reward-related decision making (e.g., Liu, Hairston, Schrier, & Fan, 2011), value computation (e.g., Clithero & Rangel, 2014), or emotional affect (e.g., Lindquist et al., 2015). Therefore, our data are supportive of the emerging neural hypothesis of a convergent valence organisation that includes the vmPFC and dlPFC, which map different types of rewards onto a common ‘value’ representation (Levy & Glimcher, 2012). This idea, stemming from classic economic utility theories (e.g., Simon, 1959), has led to studies investigating such overlap using multiple reward types; however, the majority of these have either compared pure value-related representations (e.g., monetary vs. physical goods; FitzGerald, Seymour, & Dolan, 2009), monetary and primary rewards (e.g., food; Levy & Glimcher, 2011), or all three (e.g., Chib, Rangel, Shimojo, & O’Doherty, 2009). Our finding of a common coding of emotional and reward-related affect in these regions expands the current hypothesis to include pure emotive valences (that are distinct from social judgements; e.g., Smith et al., 2010) within the core valuation network, in that positive affect arising from happy faces and negative affect arising from angry faces can be represented in a similar manner to tangible rewards on this common scale. However, an important point to consider is the level of selectivity of these regions to different types of affect. Although it may seem elegant (and simple) to attribute certain regions to positive affect and vice versa, meta-analytic studies in fact show that these regions might be valence-general (e.g., reward: Liu et al., 2011; emotion: Guillory & Bujarski, 2014). For example, Lindquist et al. (2015) proposed a valence-general affective workspace where regions involved in affect processing are responsive to both positive and negative valences, which is determined by the current cognitive state of the individual. This could explain why our findings only show common activity modulations in vmPFC and IFG/dlPFC, which responded in the same direction for both tasks when presented within the current experimental context. That said, when considering the two tasks separately, we found valence-general or ‘saliency’ effects (positive + negative compared with neutral valence) in the Emotion task in the midcingulate and middle temporal regions (see Table S1 and Fig. S2 in the Supplemental Materials). However, apart from this, and the vmPFC and IFG/dlPFC clusters, we did not observe any common valence-related activations in the amygdala, insula, or striatum, which is surprising given the level of involvement of these areas in affective processes. However, we could speculate that for some of these regions, the two tasks are too disparate in nature to engage similar neural processes (i.e., a region could code for positive affect in one task, while coding for negative affect in another), or when presented within the same task context, only one is able to elicit robust neural activity, even perhaps at the expense of the other, in these regions. Yet it is of course also possible that there was insufficient power in our data to detect robust effects in these regions (see Fig. S3 in the Supplemental Materials). For this reason, and to also further validate the link between emotional and motivational affect and the idea of a shared valuation network, we examined neural activity in four ROIs that have been most often associated with positive and negative valence processing across diverse domains (see Fig. 4). This included the left and right anterior insula, and two ROIs specifically given by Bartra et al. (2013), who found vmPFC and VS to carry modality-independent value signals, suggesting that these regions may represent a final common path. We observed a strong valence effect for vmPFC, which was expected due to a large anatomical overlap between this ROI and our voxel-based finding in the right superior medial gyrus. But, despite the strong a priori hypothesis, we failed to find any evidence of shared affective processes between the two tasks in the VS or the anterior insula. A qualitative look at the results (with a more lenient threshold) revealed that there was a potential task difference in the VS with Emotion eliciting larger BOLD responses compared with Reward, and a trend towards negative affect-related activity in the left anterior insula (which is in line with previous findings; e.g., Lindquist et al., 2015)—however, this latter difference was again mainly driven by the Emotion task. Although somewhat unexpected, the more pronounced activity modulations based on valence, as well as overall higher activity levels in the Emotion task, may be attributed to the inherent task differences between the Emotion and Reward blocks, which are discussed below. Lastly, considering that responses to negative valence stimuli are overall slower, it seemed warranted to discuss the putative role of the IFG/dlPFC activation in our study, in that the activity increase could reflect not only valence but also longer processing time, or both. While not providing a conclusive answer, the results of an additional RT covariate analysis suggest that activity modulations in this region are unlikely to be a mere reflection of longer RTs in the negative conditions (see Follow-Up Analyses section in Supplemental Materials). Specifically, while there is some overlap, the cluster that is activated by negative valence is much larger than the one that is modulated by RT in general, and most importantly, the valence-based activation is preserved when RT is included in the model to account for additional variance (see Fig. S4 in the Supplemental Materials). Although we aimed to match the task conditions as close as possible, the tasks differed in two main ways, namely the stimulus material and the required categorisation thereof, and this seems to be reflected in the voxel-wise main effects of task (see Table 1B; Fig. S1 in the Supplemental Materials). Specifically, the classification of objects into discrete categories (animal, man-made object, food) in the Reward task may have potentially required less effort compared to classifying facial expressions. In particular, facial expressions can be seen as rather subjective (i.e., perceived as more ambiguous than objects), and are also highly relevant social cues that capture our attention more readily and also for a longer amount of time (Theeuwes & Van der Stigchel, 2006; Weaver & Lauwereyns, 2011), especially when they carry salient information, such as an angry expression (Eastwood, Smilek, & Merikle, 2003). Therefore, the differences in the innate characteristics of the task stimuli may have limited the extent to which affective signals may overlap in these highly responsive regions, which is evident by the finding of task-specific activations, including the fusiform face area and the inferior parietal lobule for the Emotion task, both of which are well-associated with higher level face feature processing (Kanwisher, McDermott, & Chun, 1997; Sarkheil, Goebel, Schneider, & Mathiak, 2013). In contrast, the Reward task elicited activity in the bilateral fusiform gyri and the left orbitofrontal gyrus (OFC), when compared with the Emotion task. The activations of fusiform gyri, thought to be involved in the encoding of object properties (Grill-Spector & Sayres, 2008), and the OFC, which plays an important role in value coding and goal-directed behaviour (Wallis, 2007) are in line with what we would expect from studies that use object categories to signal reward. These task-specific activations indicate dissociable neural processes that subserve face and object recognition, respectively, highlighting the innate differences between the two tasks (see Fig. S1 in the Supplemental Materials). Furthermore, an interaction in the left middle temporal gyrus was observed between task and valence, driven by low levels of activation and deactivation in the angry and neutral face conditions, respectively, within the Emotion task, compared with higher levels of activity in the Reward task in the neutral trials (see Fig. S1C). Although speculative, such a pattern may be reflecting a level of habituation in terms of our emotional stimuli, where faces may be perceived as being more homogeneous (e.g., Fischer et al., 2003), compared with the discrete (and heterogeneous) items used in the Reward task that encompass multiple categories (rather than just one category—face—used in the Emotion task). Here, it must be mentioned that despite these neural differences and interactions between the tasks, the behavioural results indicate that they were matched to a certain extent, with no significant response time or accuracy differences between the two types of neutral trials (NeutEmo and NeutRew). As these conditions represent a baseline within their respective context (i.e., they do not carry any affective information), it seems plausible to assume that the tasks themselves did not differ in difficulty. Notably, we saw a pattern of predominantly right-hemispheric activity for the Emotion task compared with Reward, suggestive of affect-related activations that are mostly associated with negatively valenced emotion (e.g., Guillory & Bujarski, 2014), in line with the idea that right prefrontal regions are lateralised for unpleasant emotion and avoidance motivation (Miller, Crocker, Spielberg, Infantolino, & Heller, 2013). This is further indicated in the behavioural data where there was a significant slowing down of responses to angry faces compared to both happy and neutral faces. This may reflect an innate desire to process a potential (visual) threat more deeply, resulting in a delayed disengagement from the stimuli (Belopolsky, Devue, & Theeuwes, 2011; Fox, Russo, & Dutton, 2002), as well as a potential conflict between automatic avoidance behaviour (in response to negative/threatening stimuli; e.g., Marsh, Ambady, & Kleck, 2005) and the required button press (which qualifies as a basic ‘approach’ response). The Reward task elicited activity in the left OFC, which suggests that, despite the ‘rewarding’ nature of positive affect across both domains, only extrinsic reward-related events robustly engaged this region, cementing its role in the encoding and learning of reward/value associations, on top of coding for general positive salience (see for reviews, Kringelbach, 2005; O’Doherty, 2007). While beneficial effects of monetary incentives were seen in the Gain condition, no similar beneficial effects for Loss trials, which were not significantly different from NeutRew trials. However, there were also no detrimental effects of negative valence in the Loss trials, unlike in the Emotion task (i.e., RTs to Angry trials were significantly slower than to Neutral faces; see Fig. 2). Such separation, which is apparent at the level of behaviour between motivational and emotional valence, is interesting as it suggests that negative affect does not lead to the same level of response slowing in Reward compared with Emotion, promoting the idea that reward-related information strongly modulates how behaviour is manifested, even if the actual stimulus valence is negative. Specifically, in case of negative valence, the negative affective connotation of a potential Loss stimulus, which is shared with negative emotional facial expression, may be ‘counteracted’ by the instrumental goal to preserve monetary incentives, and eventually map onto a similar approach mechanism, due to their shared end-state goal of obtaining (or keeping) a reward. Note that the absence of response facilitation in Loss trials in comparison with neutral trials, which is at odds with earlier findings that conveyed positive and negative incentive information via a task cue (e.g., Engelmann, Damaraju, Padmala, & Pessoa, 2009), may be explained by our paradigmatic choice to have participants respond to the valenced stimulus directly, in the absence of any cues, thereby abolishing typical strategic processes. Moreover, participants were instructed to maximise their overall outcome and never received explicit loss feedback in a trial-by-trial fashion, which may have diminished the drive to avoid a potential loss. That said, the valence commonality in the neural data is all the more intriguing and indicates that loss-related stimuli are coded as negative, even in the absence of explicit negative feedback. Regarding positive valence, both happy faces and gain-related objects qualify as positive events, but only gain-related trials entail an instrumental component to promote fast responses. In other words, at least in the present paradigm, positive emotional valence is not sufficient to facilitate responses to those stimuli, which contrasts with previous work manipulating positive emotion and reward in a more sustained rather than stimulus-based fashion (Chiew & Braver, 2014). Importantly, this is in spite of what we see on the neural level, where activity modulations are shared across both negative (and positive) conditions for the two tasks in at least two regions that have been frequently implicated in affect processing. This further supports the idea that there may be an underlying network that codes positive versus negative valence irrespective of the exact nature of the stimuli and tasks. In sum, to the best of our knowledge, this is the first study that shows common valence coding effects across emotion and motivation, hinting at the possibility that valence is represented in a common currency, rendering emotional and motivational processes mutually dependent to some degree. This is in line with the theoretical account that they are not only related but that they cannot be regarded as completely separate entities because one will always activate the other to a certain extent (e.g., Lang & Bradley, 2008), in that hedonic properties exist for both emotional and motivational processes. What differentiates them, among other aspects, is the difference regarding goal-oriented actions that is most apparent at the level of behaviour, with motivation promoting instrumental goals (preferred outcomes) and emotion triggering more natural evaluation processes, including social aspects, which are less tied to specific goal fulfilment. However, despite the inherent paradigmatic differences between the two tasks (such as instrumentality and stimulus material), our findings of common activity modulations in vmPFC and dlPFC further corroborate the idea of a shared affective network, and add to the evidence that monetary incentive stimuli indeed entail signed basic valence signals, above and beyond the instrumental instruction to perform both gain and loss trials as accurately as possible to maximise the outcome. This study was supported by a starting grant of the European Research Council (ERC) under the Horizon 2020 framework (Grant No. 636110 awarded to R.M.K.). JASP Team (2017). JASP (Version 0.8.2)[Computer software]. Available at: https://jasp-stats.org/.